The Revco Explosion-Proof Undercounter Freezer lets you safely store hazardous material within your lab. Spark free interiors and exteriors, and hardwiring help reduce the risk of explosion of volatile substances. The tough white exterior is easy to clean. This explosion proof Revco undercounter freezer is compact and can be tucked away under your bench to free up real-estate within your class 1, groups c and d environments. This explosion proof undercounter freezer has a 4.28 cu ft capacity with adjustable, coated shelving and a maximum capacity of 10 gallons. Please note, a clearance of 40 inches at the fronts, and 1.75 inches at the top should be observed. The thermostat of this lab freezer is located outside in the back for safety, the lowest temperature it will reach is -15°C. 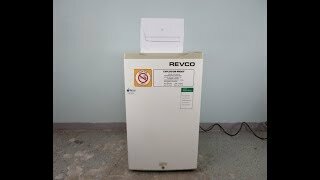 This Revco Explosion-Proof Undercounter Freezer. This unit has been tested, and is performing at factory specifications. All of our used lab equipemnt comes backed with our standard warranty. If you have any questions, please don't hesitate to contact us.